Brabant Potatoes, known as Louisiana fries, are made from peeled and cubed potatoes, first blanched, then deep fried and tossed with a rich, butter garlic sauce. A delicious side for fish, or any main dish! 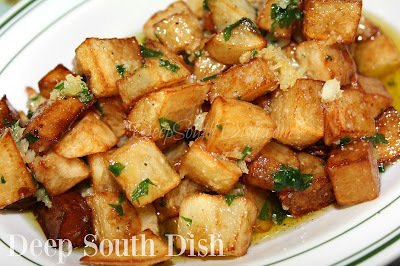 While still served in high end restaurants around here on the Gulf Coast, I'm afraid that Brabant Potatoes, a Louisiana style, cubed, fried potato side, has mostly fallen out of favor with home cooks in recent years - probably due to their multiple steps. Although folks seem to be making their way back to home cooking - and often, lamenting the fact that they didn't pay more attention to their grandmother in the kitchen - I'm afraid that in this hurry up, busy world we live in, we've mostly become more of an eat out and fast food nation. This is especially sad for someone like me, who truly enjoys not only the creative process of cooking and of sharing with others, but also the distinct flavors of a lovingly prepared, home-cooked meal. Unfortunately, our younger generation may not even know what that tastes like anymore. Of course, yes, my blog is my work now, and my work is centered around cooking, so I have the advantage of working in my home, the way I want to work, and not how somebody else dictates I should work. All of that considered, bloggers work much harder than folks think, and especially when it involves cooking, so it seems my time is as cramped as it's ever been in all of my working life! Snapper Collar with Shrimp, Gulf Crab, Roasted Fennel, Pickled Ramps and a Lemon Garlic Broth - the winning entry from Chef Alex Eaton of The Manship Restaurant, Jackson Mississippi, at the 2016 Mississippi Seafood Cook-Off competition, where I participated as one of the judges. I got to eat that y'all, and it was delicious! Unfortunately, my casual restaurant and fast food experiences the past few years have not exactly matched those dishes and have been, well... mostly underwhelming. Tough gristly, not at all inexpensive steaks, overcooked, under-seasoned seafood, soggy, droopy or even cooked over again fast food fries, burgers so dry that you could choke on them, or else dripping with a gross overabundance of condiments, slapped on stiff, tasteless stale buns. Nothing looks anything at all like it's advertised! I don't know if it's just around here or everywhere, but what the heck is going on? Maybe I'm a little bit spoiled, but home cooking is in my control, and frankly, far better than fast food can ever be. Oh mercy ... forget it. Let's get back to these potatoes, shall we? I'm not sure anybody, including me, knows where Brabrant Potatoes came from, how they came to be named that, or even how they've made their way to the Deep South - although by virtue of the name, they do appear to be Dutch in their origin, and for us, they speak the New Orleans language. The difference between these and say our more classic skillet fried potatoes or home fries, is the process. For brabrant, first, potatoes are cubed and parboiled. Second, they are deep fried instead of skillet fried, and last, finished with a toss in a rich, buttery garlic sauce. Not exactly diet friendly, but then they aren't really intended to be consumed in massive quantities either. They are an enhancement, a side dish, often served alongside fish or seafood here in the Deep South, although they're good with pretty much anything else. To save some time, cubing and boiling the potatoes in advance is a good idea when preparing this dish, and they can be held in an airtight container in the fridge for a day or two until you're ready to fry them. Once fried, they're transferred to a low oven, which dries them to help with receiving the sauce, but also keeps them warm while you prep the rest of your dinner. Here's how to make them. As always, scroll past the step by step tutorial to get the full recipe with measurements, instructions and a printable link. For the garlic butter sauce, melt butter in a medium saucepan, add oil and garlic and simmer until garlic is tender; set aside to cool. Once cool, stir in chopped parsley. Combine seasoning blend in a separate bowl; set aside. Peel potatoes and cut into 3/4 inch cubes, holding in a bowl of cool water as you go. Drain and transfer to a saucepan and cover with fresh water. Bring to a boil and boil only until slightly tender, about 10 minutes; drain. Preheat oven to 175 degrees F. Heat oil in a large, deep, heavy pot. Add the potatoes, frying in batches, and turning to brown evenly, for 3 to 4 minutes. Right as they come out of the fryer, transfer to paper towels, sprinkling each batch lightly with a pinch of the seasoning blend. Transfer potatoes to serving platter and place into warm oven, about 20 minutes, while you prepare the rest of the meal. Add any remaining seasoning to the garlic butter sauce, add potatoes to the saucepan and toss. Return to serving platter and serve immediately. See more of my yummy potato recipes on Pinterest! Peel potatoes and cut into 3/4 inch cubes, holding in a bowl of cool water. For garlic butter sauce, melt butter in a medium saucepan, add oil and garlic and simmer until garlic is tender; set aside to cool. Once cool, stir in chopped parsley. Combine seasoning blend in a separate bowl; set aside. Drain potatoes and transfer to a saucepan, covering with fresh water. Bring to a boil and boil only until slightly tender, about 10 minutes; drain. Preheat oven to 175 degrees F. Heat oil in a large, deep, heavy pot. Add the potatoes, frying in batches, and turning to brown evenly, for 3 to 4 minutes. Right as they come out of the fryer, transfer to paper towels, sprinkling each batch lightly with a pinch of the seasoning blend. Transfer potatoes to serving platter and place into warm oven, about 20 minutes, while you prepare the rest of the meal. Add any remaining seasoning to the garlic butter sauce, add potatoes to the saucepan and toss. Return to serving platter and serve immediately. Cook's Notes: Cubing and boiling the potatoes in advance is a good timesaver when preparing this dish, as they can be held in an airtight container in the fridge for a day or two until you're ready to fry and finish them. Cornmeal Fries: Blanch potatoes as above. Combine the seasoning mix with 1/4 cup each self-rising flour and all-purpose cornmeal. Drain potatoes and transfer to cornmeal mixture. Fry potatoes as above. May be served with or without the garlic sauce. My Mom used to make potatoes very similar to those! The differences are: she cut them in half (small new potatoes), cook them till tender then deep fry while they were still hot. Sometimes with the skins on and sometimes without but no sauce was added. They were so crispy and good!!! I'm going to make them tonight!!! These sound awesome and must be tried. Many years ago, my Cajun Me'mere (grandmother for those that might not know) made these. This was 50 years ago. I never did learn the recipe as I was so young when she passed. Reading the description of these, I just know this is what we enjoyed. This is on this weekends menu, no doubt. Thanks Mary for bringing back such wonderful memories! You're so welcome Jan - enjoy the memories!! Yes. The frozen cubed potatoes would stand in for the parboiling. I would follow the directions on the package for deep frying them on whether to thaw or not (I'm thinking not), and then finish with the sauce. No, not really because you see here in the south, we don't call that version "home fries," we just call them fried potatoes! The preparation of the recipe here however, is a bit different from those, and actually the garlic butter sauce is an integral part of what makes them different and what sets them apart as Brabant potatoes. 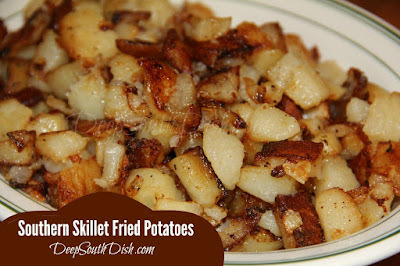 You see, there really is more than one way to skillet fry a potato!